RoAnna Sylver is passionate about stories that give hope, healing and even fun for LGBT, disabled and other marginalized people, and thinks we need a lot more. 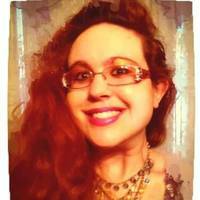 Aside from writing oddly optimistic dystopia and vampire books, RoAnna is a blogger, artist, singer, and voice actor. RoAnna lives with family and a small snorking dog near Portland, OR, and probably spends too much time playing videogames. The next adventure RoAnna would like is a nap in a pile of bunnies. To ask RoAnna Sylver questions, please sign up. Stake Sauce Cover Reveal and Pre-Orders! Because today you can pre-order Stake Sauce Arc 1: The Secret Ingredient Is Love. No Really on Amazon, Gumroad, and a bunch more retailers! Here's a blog post with the cover and links! And here's where you can pre-order it directly! And if you order on Gumroad, it comes with a free bonus short story, now! We’d love your help. Let us know what’s wrong with this preview of The Cardigans by Cole McCade. I’m happy you’re happy too!! " It’s always fun to read books written about your hometown, especially by local authors. And I love the idea of SJWs (Social Justice Witches!) in Portland fighting for marginalized and disenfranchised people, and I’m always a sucker for found family stories, all of which this has in spades. The central conflict is entirely believable/pretty much ripped-from-the-headlines, and the romance at its center is sweet. The coven itself is full of interesting-seeming characters (especially Selene, who I see has a book later in the series), and the major themes of community and love in a vibrant city is lovely. We’d love your help. Let us know what’s wrong with this preview of By Earth by T. Thorn Coyle. A gorgeous collection of poems on mental health, body image, love, dysfunction, and loss. I expected heartfelt and vulnerable sincerity. I didn’t expect for them to hit quite as close to home as they did. It’s kind of hard to think about this, and that’s the only reason this review is so short (so it’s a good sign, really). We’d love your help. Let us know what’s wrong with this preview of soft in the middle by Shelby Eileen. RIDICULOUSLY BADASS. Super dark, brutal, viscerally horrifying, and all about an assault survivor rising up and taking an incredibly satisfying revenge. Enough has been said about the plot, so I’m just... still kind of blown away by the sheer emotional gut-punches and cathartic violence (yes, it absolutely can be). I swear, this is horror at its best. Giving power back to the victims, and LETTING THEM BE TERRIFYING, stronger and scarier than the monsters who hurt them. We’d love your help. Let us know what’s wrong with this preview of The Hollow Girl by Hillary Monahan. OH my gosh, I loved this one so much! I went in expecting a fun roller derby story, and it is that, but it’s also an incredibly sweet story about healing through overcoming personal challenges and camaraderie with other women (cis and trans) and finding strength in yourself. Basically what good sports movies (and books) are supposed to be made of. Also, supportive friend-families are wonderful. Oh gosh. Oh wow. This was born of the “Cockygate” lawsuit scandal, but it’s so much more than that, and more beautiful than maybe a spite-book has any right to be. But then, some of the best things in life come from spite, and this is living proof. We’d love your help. Let us know what’s wrong with this preview of His Cocky Valet by Cole McCade. “They'll use guns and they'll use words, and the worst part of all is that you might listen when they say you're a freak or a monster, and you might start to believe it.